Badass has a new name. Wow. Is now the time to tell him we are changing the logo? 😉 Hopefully if it ever changes it will just be minor enhancements like previous revisions but will keep the Circle of Friends aspect. Nice… I considered the old style logo but yours is really sharp with the earth tones…. It would be cool to see how many people are Branded with Ubuntu. Just ignore that comment. Haters gonna hate. 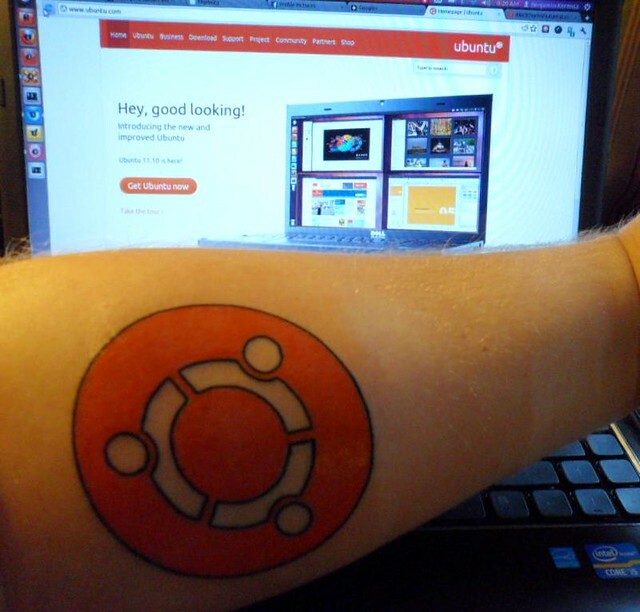 There are only a handful of people with Ubuntu tats that I can find on the “interwebs.” I see many with the rectangular frame and a logo design in the middle. Is your ink on the top of your arm, or on the inside of your forearm? when I saw that he was getting a tat, and he had post “guess what it’s gonna be” I immediately thought it was going to be an Ubuntu logo, and I wasn’t wrong, as I found out later via G+. ’tis true, but more likely a troll, don’t feed the trolls, Ben!!!! Love it! They did a great job, those colors are crisp! !